I went to the Cooper Hewitt gift shop the other day and ran across this really cute Japanese picture book called Brooch. It's made up of translucent paper so each upcoming illustration is unveiled when viewing the current picture. And it's these whimisical colored pencil (?) drawings of animals, people, color and pattern that make me really want this book for when I need inspiration. It runs for about $50 at the Cooper Hewitt, but I found this site and this site that you can probably purchse from however they are not American websites. 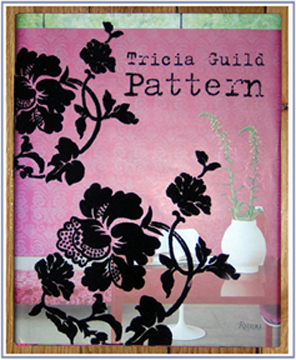 For those like myself that love bright and bold colors, check out this book called Pattern by interior designer, Tricia Guild of Designers Guild. She uses intense colors like fuchsia and turquoise and uses a lot of Middle Eastern accents and large patterns to make each room pop. 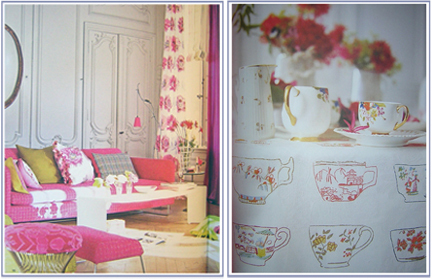 This book also has great style shots like the one with the china cup and embroidered tablecloth (above right). All I can say is this book is pure eye candy and will make you want to decorate your home with colors that you thought you would never dare to use.